LONDON (AP) — The biggest study ever of women who had ovarian tissue removed, frozen and transplanted suggests the experimental technique is safe and can help about one third of them to have babies. The procedure is intended for women with cancer who wish to preserve their fertility, since cancer treatments can harm the ovaries. Scientists typically remove one ovary and cut it into strips before freezing them. Years later after the woman has recovered from cancer, doctors typically graft some of the thawed-out tissue onto the remaining ovary. Researchers followed 41 women in Denmark who underwent the procedure from 2003 to 2014. Among the 32 women in the study who wanted children, 10 later got pregnant and gave birth. Globally, more than 36 babies have been born to women who had ovary transplants, with 14 in Denmark. Unlike most countries, Denmark offers the treatment free to all women who qualify. The technique is not part of routine cancer care in Britain, but is available at some clinics there and in Europe, including Belgium and Germany. “Once we transplant the ovarian tissue, it takes about four to five months for the ovary to get restarted,” said Dr. Claus Yding Andersen, the study’s senior author. The paper was published online Wednesday in the journal, Human Reproduction. 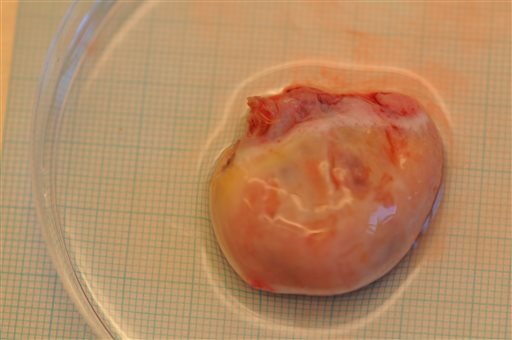 In some cases, the transplanted tissue lasted for up to 10 years, much longer than scientists had predicted. The ovarian tissue that kept working so long probably had more eggs to begin with, said Mark Fenwick, a lecturer in reproductive and developmental medicine at Sheffield University. He said mothers and babies required close monitoring although no potential problems linked to the technique have been spotted so far. In the study, three women later had a cancer relapse, but Andersen said that didn’t appear to be linked to the transplant. Dr. Jane Stewart of the British Fertility Society said the technique wouldn’t be suitable for everyone and that doctors need to be careful about selecting which patients to treat. At the moment, women preparing for cancer treatment might have eggs or embryos frozen for later use. “I think patients would definitely want (the option of transplanted ovarian tissue) and there is a lot of future potential, but this isn’t ready to be rolled out tomorrow,” she said. Tags: ovarian tissue. Bookmark the permalink.